Liberation often arises from frustration. Beginning at 4pm today, 32 pianists will play Erik Satie's Vexations 840 times. I am scheduled to perform from 1:30 to 2... in the morning. Satie's piano anomaly is deceptively frustrating. The melody wanders, the same pitches are written with multiple spellings, and the curious chords leave listeners drifting in sonic clouds. Yet, with his insistence on repetition (Vexations played 840 times should equal 18+ hours of music) Satie's ideas about the profundity of boredom and the wisdom of returning to a beginner's mind, points to an approach to music that is both decorative and sublime, mundane and extraordinary, as well as frustrating and liberating. Amazing to think that Satie composed Vexations 100+ years ago in 1893, the same year that the U.S. Supreme Court legally declared the tomato a vegetable. 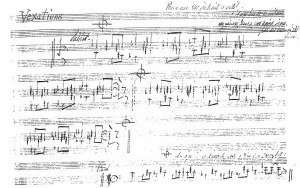 Vexations was first performed in 1963, courtesy of John Cage. Jack Straw Productions is a fitting location to host this marathon event. I fondly remember many late-night recording sessions in this unique non-profit recording studio. It will be dreamy to play the piano in the middle of the night. Not in Seattle? Listen to a live streaming broadcast on Hollow Earth Radio.